LeftyBassist.com • View topic - All of blablas basses..... Again! All of blablas basses..... Again! Post subject: Re: All of blablas basses..... Again! And it's going back to the store again, was going to finetune the action only to discover the truss rod nut was stripped. No finetuning, no bass! Amen to that. Been reading too many neck horror stories lately. Everything works okay on this one. First I need more playing time and find the (for me) sonic sweet spot before I can tell something serious about the sound. I'm familiar with the preamp but not in combination with this type of dual coils. I can tell a few things about the build quality: Both stacked pots needed a different washer inside the control cavity because the ones that were stock were too big and the pots worked themselves loose almost immediately due to that. There were some sharp-ish fret ends (for me as a builder, someone else might probably not notice this), these fret ends however were nothing that couldn't be solved by some fret-rolling with the side of a screwdriver. It's a pity the first one they shipped me had a worn out truss rod, the above mentioned build niggles ware also there on this first one. Setup out of the box was very good, there was no need to tweak the truss rod but given issues with the truss rod on the previous bass I got I tried this anyway. This one is a little bit heavier than the previous one but stil relatively light in weight. The paint/polish job is very good, no blemishes or strange spots anywhere, the accent line around the body (no blue clear paint) gives this bass some extra visual class, amazing they can do these sort of things in this price range. 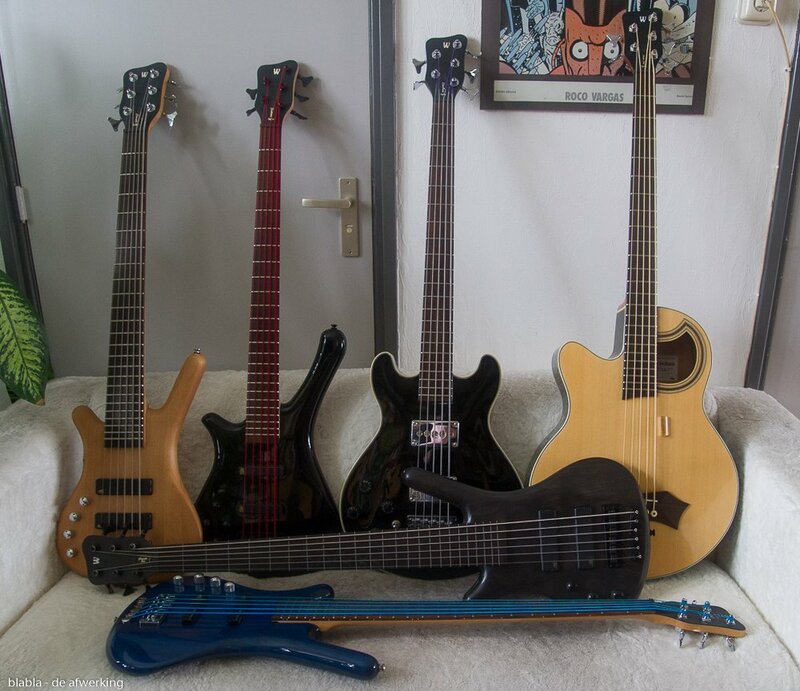 The Sire M2 five string series are 35" scale by the way (checked this myself after someone on TalkBass mentioned this), everywhere it is advertised as being 34"!! I like 35", used this scale on most of my DIY builds . And here it is with a good set of strings. The stock ones are not that good, not the same quality as the ones on the V7 and P7. Anther spot where Sire cut corners to get the low price, not that I mind I almost never like what manufacturers put on as stock anyway. 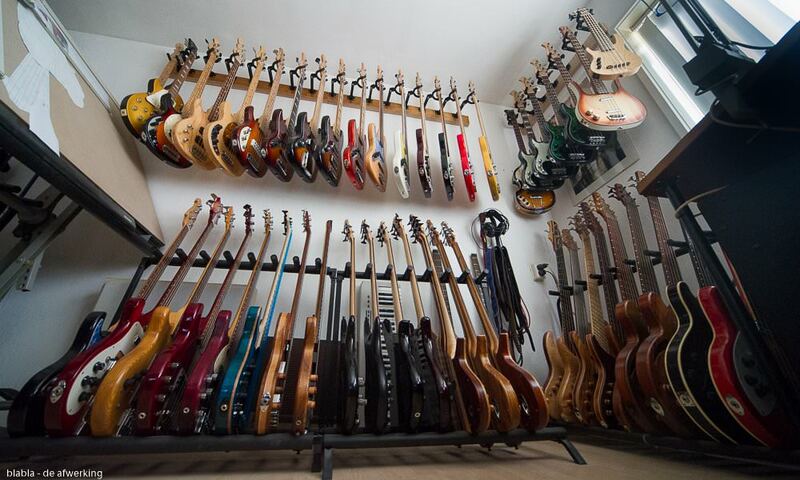 Lot's of basses in a limited space. This picture was a experiment with a extreme wide angle lens, just to see if I could make a acceptable picture with all the distortion going on, not a bad result I think. That collection pic is SICK. The Alien is a real nice acoustic bass! The Starbass is a great instrument, a lot more modern sounding than the appearance suggests.